Artists Lounge Live is a dynamic concert series which offers audiences tremendous talent in an intimate light. It proudly introduces stellar acts from America’s entertainment capitals to communities across the nation. It’s where you’ll see knockout notables share their side of the story. Artists Lounge Live brings the toast of 42nd Street to Main Street. Every entertainer’s greatest joy is experiencing that electrifying connection with the audience. That bond helps buoy the artist through a tumultuous career in show business. Artists Lounge Live affords seasoned entertainers the opportunity to make that connection a truly personal one. Singers craft their own concerts, peppering humorous and poignant stories into their repertoire of beloved musical memories. These evenings play like a backstage tour of Broadway life. The Artists Lounge Live creed is not only to entertain, but to serve. With each concert appearance, performers offer their time to make master classes available to young artists in the venue’s community. These events are free of charge. You can learn more about outreach opportunities from our partnering performing arts organizations. The Artists Lounge Live series is curated by affable crooner Michael Ingersoll. Ingersoll won acclaim portraying Nick Massi of the Four Seasons in the Tony Award-winning smash hit JERSEY BOYS. He originated the role for the First National Tour playing to sold-out crowds in San Francisco, Los Angeles, and Chicago for over 1,300 performances. After hanging up the signature red jacket, he donned a sharkskin suit as a founding member of America’s favorite retro-rock sensation Under the Streetlamp. The quartet currently tours both nationally and internationally, and boasts two PBS concert specials seen in over 100 million homes nationwide. “Performing in popular projects for millions of audience members is both a privilege and an education,” says Ingersoll. He’s learned what ignites crowds. He has a passion for connecting people with positive, life-affirming entertainment. 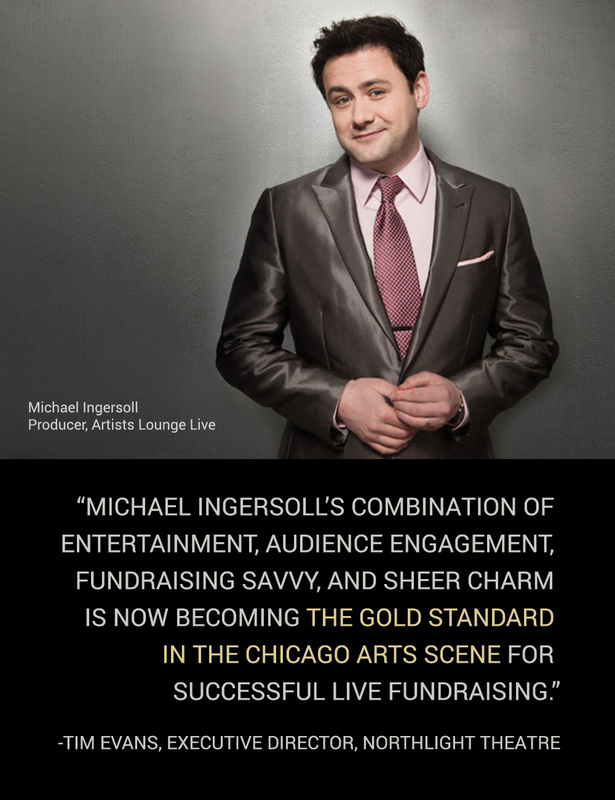 As a producer, Ingersoll has created several successful concert events with both performing arts and philanthropic organizations including American Cancer Society, United Way, and Chicago Museum of Science and Industry. His collaborations have raised over 2 million dollars in charitable funds. Ingersoll also co-produced Under the Streetlamp’s PBS concert specials. His latest venture, Artists Lounge Live, was launched with the help of Metropolis Performing Arts Centre.